When I look at my body in my full-length mirrors I do not see a symmetrical frame. I do not see a hour-glass figure with perfect breasts and rounded hips. I do not see a potential athlete, gymnast, model. What I do see is scoliosis. Scoliosis is a curvature of the spine, which, depending on the severity, can create a lopsided effect or even a deformed appearance. It is estimated that 80% of all scoliosis conditions arise in teenage girls, but most of these girls will never know about it. It is in no way a recent discovery, but it is certainly an under-publicised one. Before I was diagnosed with the condition I had never heard of it. At the age of 12 I noticed I had a slightly raised hump on the right side of my back. It didn’t feel right. The first thing I did was tell my mum, who then swiftly got me a doctor’s appointment. After my GP told me it was an over-developed muscle, I felt better. It wasn’t until I noticed that I could only feel a breast plate on one side of my torso that the bag of worries began to fill again. This time I was referred to the Royal Infirmary where I learned, after scans, x-rays and examinations, that I had a 27 degree curve called scoliosis. Neither me, my mum or, concerningly, my GP knew about scoliosis. But I was lucky; I was living in the right place. The Royal Infirmary in Edinburgh is a centre for excellence in the treatment of scoliosis. Some people aren’t so lucky; I spoke with Cynthia Klingman, from Washington State over Facebook, and she was told in 8th grade that she had finished growing and would no longer need her back-brace. Apparently there was nothing more that her doctor could do for her. Her curve then developed from a 42 degree curve into a 71 degree curve, which she has recently had surgery to correct. She is now thirty. It certainly isn’t reassuring that the medical ‘experts’ are still learning from their mistakes and are not fully sure how to deal with some scoliosis patients. 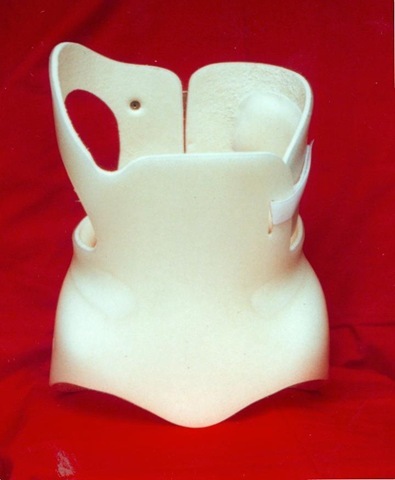 Luckily, my curve did not need surgery, and was prevented from worsening by means of Boston back-brace, which I wore for nearly two years of my teenage life. Not an easy feat but something that I managed to deal with well, but in my own way. I felt embarrassed about my brace, and only told the people I truly trusted. I didn’t want everyone to know because I didn’t want to be treated like an outcast. During my brace-life I wasn’t aware of the number of girls with scoliosis, and I certainly didn’t know about the many support groups there are. Looking back, I now wish I had. A Facebook page called ‘Scoliosis “How to Look Good Twisted”’ brings people with scoliosis together, and provides a safe-place for people to talk about their experiences. People who have undergone serious surgery, and are lying in hospital beds are able to access the page and express how they are feeling, This is so helpful for the people who are awaiting the same fate. Problem stories about misdiagnosis or unsuccessful treatment are not rare. But how can someone with, say, a 51 degree curve not know that they have scoliosis? Teenage girls often feel very self conscious about their bodies. They are watching their bodies change naturally and if they notice something strange they may feel uncomfortable asking about it. Who would they talk to? They may be too scared to find out what has to be done to fix it. They may have other more important issues in their life. They may ignore it. The list goes on and on. The issue that is a cause for concern here is that the earlier the diagnosis, the more choices there are in terms of treatment. Before I started researching for this blog, I was unaware that scoliosis can affect breathing, pregnancy and also about the process of recovery for a person after having a spinal operation (this is still not a ruled out possibility for me) . Most importantly I learnt that every case of scoliosis is different, and I hope by writing this piece people will look out for scoliosis, be aware of what it is, understand those that have it and never postpone going to the doctor. I was lucky to get the diagnosis when I did. Many people are not so lucky. If you look in the mirror and see what I see, please don’t just leave it.